I love my NeuYear productivity calendar! I chose to mount my calendar on foam board for sturdiness and hang it horizontally to fit my space perfectly. I love having Saturday & Sunday aligned in one weekend column for easy planning. Being able to see the whole year in one glance has helped me plan further ahead then I would normally. Since the board is not eraseable, I chose to use colored sticky notes for major events that may change in the future. Sticky notes also allow me to color code my events and I don't have to re-write if I decide to change the event. Thanks for a great product! ...the past has been (either for yourself, your work, your family, and/or your life), then I hope you'll take part in a special class that Dr. Meggin McIntosh will be presenting on Wednesday, December 28, 2011 (for the fifth year in a row). To learn more and to register, just go this webpage with all the information. I have learned myriad ideas from Meggin McIntosh over the years and I know from experience that this class is one that will more than deliver on her promises! Take a look here.On Thursday, August 18th, Social Club 2.0, a local networking group, hosted a Book Launch Party in my honor to celebrate the launch of my book, The Ultimate Life Organizer. The event was held at the beautiful Chateau Hathorn in Warwick, NY. What a successful event! I was thrilled to see so many friends, family, clients and colleagues come out to support the launch of the book. Thank you from the bottom of my heart. An extra special thank you to Chris Masters of Social Club 2.0 for arranging and hosting the event. Here are some photos from the event. Enjoy! PS - If you missed the event, I will be conducting Meet the Author Book Signings at Linda's Office Supplies in Goshen, NY on Saturday, September 17th from 11 am - 2 pm and at Frazzleberries Country Store in Warwick, NY on Thursday, October 13th from 6:30 - 8 p.m. Both shops will now be carrying the book so be sure to stop by and check out their displays! Lisa will be presenting “Downsize Your Clutter and Your Life” next Tuesday, August 16th from 11:30 AM – 1:30 PM at Glen Arden Continuing Care Retirement Community, 214 Harriman Drive, Goshen, NY. Lisa will provide helpful tips on how to downsize and organize, and will show examples of how she has made downsizing easy for area seniors. A complimentary lunch will be served. Please RSVP to 845-360-1410 to attend.Unfortunately, summer will soon be coming to an end. I know, don't rush it! Enjoy the last days of summer. Perhaps you have a vacation planned, or want to just stay at home and relax. But fall will be here before you know it. So, take some time now to plan your back to work strategy for fall now. Hopefully, the following tips will help get you started. Follow through on these tips and you will be well on your way to a productive autumn season! Meanwhile, if you have a great office (home or work) productivity tip, email it to info@getbuttonedup.com or share it on their Facebook page at www.Facebook.com/GetButtonedUp for the chance to win a free Dymo label maker. The winner will be chosen randomly. Full disclosure: This is sponsored content and I have been compensated to do this post. That being said, I do not blog about anything I do not believe in and Dymo did not edit this post or direct the content in any way. Unsure if you are getting the most out of your business? Unclear as to whether your business is going in the right direction? Feeling like you could use a business plan revamp? Designed as a series, but able to be taken individually too, each teleclass is 90 minutes in length. Can't make the live calls? No problem! All teleclasses will be recorded & available by on MP3. "She's bright and shiny on a dreary day, she sings, she dances, she's a Professional Organizer, oh and did I mention she's an attorney too? 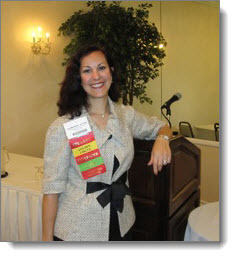 She's Lisa Montanaro, and she was one of our favorite teleclass guest experts last year. Lisa can answer all those pressing questions you have been afraid to ask or didn't know where to turn to for the answers. What I really like about her is her approachability. Speaking to a business coach and attorney can be a little intimidating, but Lisa knows how to answer the tough questions while making sure you truly understand the answers." "You are very well-spoken and a wonderful presenter. You did a great job providing so much relevant content and without giving us that feeling of info-overload." "I went to your workshop at the NAPO Conference and just wanted to tell you how impressed I was. You are such a knowledgeable and good speaker. I have already implemented so many of your suggestions. Yours was the only CD I purchased from conference. I am sure your session will benefit me for years to come." "The level of energy and enthusiasm you bring into the training environment is truly admirable and your organizational skills certainly show proof of the amount of effort and thought you place in preparing for your workshops." "Your workshop at the NAPO National Conference was alone worth my entire investment (registration, hotel, transportation, food, etc.). Thank you so much!" About the Presenter: Lisa Montanaro is an inaugural Certified Professional Organizer, Business & Life Coach, Motivational Speaker, and Author. Lisa founded LM Organizing Solutions, LLC in 2002, and since then, has helped thousands of people and organizations live better lives and operate better businesses. A sought-after business expert due to her background as an attorney, mediator, and trainer of entrepreneurs, Lisa offers business coaching to professional organizers, and other entrepreneurs and small business owners. Part consultant, part coach -- Lisa gives expert advice, while also guiding clients to the answers they seek. Lisa presents at national conferences, has been interviewed by television and radio hosts, is a frequent guest expert for national teleclasses and webinars, and has been widely published on the web and in print. I coined an interesting phrase recently when I was facilitating one of the teleclasses for my group coaching program, DECIDE to be Organized. I was speaking to the group about how so many high functioning, busy, successful men and women have all of these passions and get overwhelmed with trying to decide which to do and which to implement. I referred to the act of managing all of those passions as "Passion Management" (instead of Time Management, Project Management or Energy Management). Everyone loved the phrase and I realized I was onto something. Passion Management acknowledges that we do, indeed, have multiple passions. I, for one, always refer to myself as a multi-passionate entrepreneur and person. Also, Passion Management is a much more positive way of describing our dilemma of what to do with all of these great ideas. Time management and project management are terms that are not only overused but, unfortunately, can be a negative reminder of our lack of time, as opposed to a motivating factor that leads to productivity. Passion Management is the ability to manage all of the passions you want to tackle in business and life. Here are some tips to help guide your Passion Management. If you are interested in purchasing a NeuYear Calendar, check out their site at http://www.neuyear.net/. I love my NeuYear productivity calendar! I chose to mount my calendar on foam board for sturdiness and hang it horizontally to fit my space perfectly. I love having Saturday & Sunday aligned in one weekend column for easy planning. Being able to see the whole year in one glance has helped me plan further ahead then I would normally. Since the board is not eraseable, I chose to use colored sticky notes for major events that may change in the future. Sticky notes also allow me to color code my events and I don’t have to re-write if I decide to change the event. Thanks for a great product! Teleseminar: Obstacle Illusions – Are You Delusional? …the past has been (either for yourself, your work, your family, and/or your life), then I hope you’ll take part in a special class that Dr. Meggin McIntosh will be presenting on Wednesday, December 28, 2011 (for the fifth year in a row). To learn more and to register, just go this webpage with all the information. Book Launch Party a Success! On Thursday, August 18th, Social Club 2.0, a local networking group, hosted a Book Launch Party in my honor to celebrate the launch of my book, The Ultimate Life Organizer. The event was held at the beautiful Chateau Hathorn in Warwick, NY. What a successful event! I was thrilled to see so many friends, family, clients and colleagues come out to support the launch of the book. Thank you from the bottom of my heart. An extra special thank you to Chris Masters of Social Club 2.0 for arranging and hosting the event. PS – If you missed the event, I will be conducting Meet the Author Book Signings at Linda’s Office Supplies in Goshen, NY on Saturday, September 17th from 11 am – 2 pm and at Frazzleberries Country Store in Warwick, NY on Thursday, October 13th from 6:30 – 8 p.m. Both shops will now be carrying the book so be sure to stop by and check out their displays! Lisa will be presenting “Downsize Your Clutter and Your Life” next Tuesday, August 16th from 11:30 AM – 1:30 PM at Glen Arden Continuing Care Retirement Community, 214 Harriman Drive, Goshen, NY. Lisa will provide helpful tips on how to downsize and organize, and will show examples of how she has made downsizing easy for area seniors. A complimentary lunch will be served. Please RSVP to 845-360-1410 to attend. Teleclass Series: Bold Business Moves! Can’t make the live calls? No problem! All teleclasses will be recorded & available by on MP3. Register Online for all sessions here (or follow the links below to register for individual teleclasses). Business Systems help a business to run without you if you become ill, take a vacation or go to a business conference. They provide the infrastructure that needs to be in place to effectively delegate without taking up too much of your precious time as the business owner. Business systems make it easier to hire and train an employee or retain an independent contractor, delegate to an assistant, to yourself, or to the business itself. Business Systems and Operations Manuals will not only help you run your business more effectively, but will help you start preparing for your exit strategy. This teleclass will guide you in creating an Operations Manual and cover what it should include. Register for the May 31st session here. Register for the June 14th session here. Are you a solopreneur and often find it lonely? Maybe you are you a small business owner with employees or subcontractors, but find yourself wanting to brainstorm with those outside your business? You can! Imagine a group of people that are available to bounce business ideas off of, help you make pivotal business decisions, and serve as a sounding board. 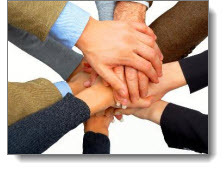 Set your business up for success by enlisting the help of others. Options are plentiful, from using virtual assistants, independent contractors, and employees, to brainstorming with business colleagues, setting up a formal Board of Advisors, participating in a Mastermind group, or hiring a business coach. Studies show that business owners achieve success more frequently when they set up accountability programs. Identify different ways to partner with others to improve your business by engaging in coopetition, and learn the differences between various types of accountability tools. Determine which accountability tools are the best match for your business, and how to implement them. Hear about what other like-minded entrepreneurs are doing. Walk away with a plan to enlist the help of others in your business in a way that makes the most sense for your business model, stage, and needs. Get ready to create your village! Register for the June 28th session here. IRIS & NAPO members, professional organizers, interior designers/redesigners, home stagers, coaches, consultants, entrepreneurs, etc. Do you want to brainstorm with like-minded business owners, while learning from a business coach, lawyer and trainer of entrepreneurs? This series is a cost-effective way to get quality business advice at a fraction of the cost of one-on-one coaching/consulting. Come join us for a teleclass series that promises to deliver great results! Lisa Montanaro is an inaugural Certified Professional Organizer, Business & Life Coach, Motivational Speaker, and Author. Lisa founded LM Organizing Solutions, LLC in 2002, and since then, has helped thousands of people and organizations live better lives and operate better businesses. A sought-after business expert due to her background as an attorney, mediator, and trainer of entrepreneurs, Lisa offers business coaching to professional organizers, and other entrepreneurs and small business owners. Part consultant, part coach — Lisa gives expert advice, while also guiding clients to the answers they seek. Lisa presents at national conferences, has been interviewed by television and radio hosts, is a frequent guest expert for national teleclasses and webinars, and has been widely published on the web and in print. Realtors, Great Food, and Organizing Tips! Check out this blog post by Matt Williams, broker/owner of Realty Executives, Williams-Sykes Realty in Dutchess County, NY. Matt and I met a few years ago when he asked me to speak to a group of busy realtors from his office. We have kept in touch, and Matt has now invited me to speak to an even bigger group of realtors to help them be even more successful!